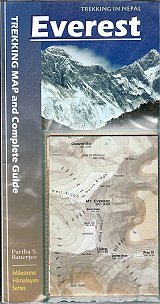 Comprehensive, illustrated guidebook for treks in the Everest region of Nepal that comes with a detailed, easy-to-read foldout trekking map. With some 150 color pictures and over a dozen section maps (apart from the fold-out map at the back), the guidebook is packed with exhaustive day-by-day descriptions of the popular Everest trails: Lukla-Kala Patthar/Everest Base Camp; Gokyo-ChoLa Pass; Side-trips to Thame, Chukhung and over RenjoLa Pass; Jiri-Lukla walk-in. There is, in addition, practical advice on planning the treks, plus background reading on the Sherpas, the people who live in the shadow of Everest, and an entire chapter on the fascinating history of the discovery and conquest of Mt Everest.